WASHINGTON—Confidential studies by Food and Drug Administration officials recommend that GlaxoSmithKline's Avandia, a diabetes medicine, get pulled from the market because it is linked to heart attacks. The studies, released as part of a report on Avandia by staff of Senate Finance Committee members Chuck Grassley (R., Iowa) and Max Baucus (D., Mont. ), also say any head-to-head trial where patients get Avandia and Takeda Pharmaceutical Co.'s diabetes medicine Actos would be "unethical and exploitative." GlaxoSmithKline is currently sponsoring a study, called TIDE, where patients get either Avandia, Actos or other medicines. 500 heart attacks, and 300 heart failures--a month? 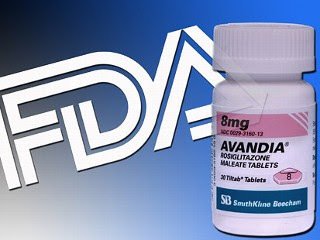 The New York Times said an FDA advisory board voted, 8-7, in 2007 to accept the advice of an independent committee that while Avandia might increase the risk of heart attack, it should stay on the market.